I don't think anyone can argue against the fact that to be an effective developer, you need to somehow attain sufficient focus to fully take in the task at hand, and be sufficiently in the zone that answers to the problem at hand come naturally. In a way, programming is like that, a transcendent form of art. At least, it is, to some degree, for me. And I do feel that given sufficient focus, calm and quiet (or perhaps background noise, depending on the mood I'm in), I can get "in the zone", and solutions to what I'm trying to do come somewhat naturally. Not to say that I'm necessarily writing good code, but at least it forms some sort of sense in my mind. People have different ways to achieve focus. Some meditate, some have it come to them more easily than others. It does happen that for some people, it works well to execute some kind of ritual to get in the right frame of mind: those can be as insignificant as getting out of bed in a certain way (for those fortunate enough to work from home), or a complicated as necessary. I believe many, if not most, integrate it in their routine, to the point they perhaps forget what it is that they do to attain focus. For me, it now happens to be shaving, and the associated processes. It used to be kind of a chore, until I picked up wet shaving, and in particular, straight razor shaving. I won't lie, the first shave with that relic was a scary experience. I wasn't at all sure of myself, with only a few tips and some videos on Youtube as training. I had bought a straight razor from Le Centre du Rasoir near my house after stumbling on articles about barbershops on the web, and it somehow interested me. Since then, I've slowly taken up the different tasks that go with the actual act of shaving with a straight razor: honing the blade, stropping, shaving, etc. ; picking up the different tools required (blade, strop, honing stones, shaving creams or soaps, etc.). 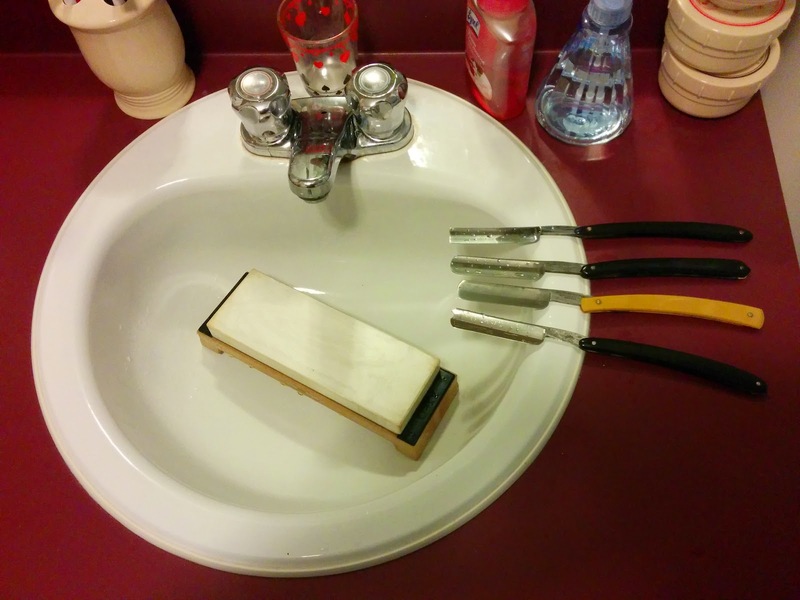 It's as I was slowly honing and restoring four straight razors that got to me from eBay and as a gift from my father than I thought of writing this post, in a short break I took from the honing. Getting back home and putting the finishing touches on the four razors got me to think, and I noticed I had again become much more relaxed just by taking the time to do one thing well, taking care in what I was doing. I think every developer.... well, everyone can benefit in acquiring some kind of ritual like this, using our hands rather that our brain to achieve something. It's at least a great experience to get a little bit away from technology for a short while, visiting old skills of earlier times. As for the wet shaving itself, I'd be happy to respond to comments here, or blog again about it if there's enough interest in the subject; I'd love to hear that I'm not the only one in the Ubuntu and Debian communities crazy enough to take a blade to my face. Last month, I blogged about urfkill, and what it's meant to be used for. The truth is, flight mode and proper killswitch (read: disabling radios on devices) handling is something that needs to happen on any device that deems itself "mobile". As such, it's one thing we need to look into for Ubuntu Touch. At this point, urfkill seems to be in the proper state to make it, with the latest changes from the upstream git repository, into the distro. There is no formal release yet, but this is likely to happen very soon. So, I uploaded a git snapshot from the urfkill upstream repository into Trusty. It's now time to ask people to try it out, see how well it works on their systems, and just generally get to know how solid it is, and whether it's time to enable it on the desktop. In time, it would be nice to replace the current implementation we have of killswitch persistence (saving and restoring the state of the "soft" killswitches) currently in two upstart jobs — rfkill-store and rfkill-restore — with urfkill as a first step, for the 14.04 release (and to handle flight mode on Touch, of course). In the end, my goal would be to achieve convergence on this particular aspect of the operating system sooner than later, since it's a relatively small part of the overall communications/networking picture.